It’s a little surreal to think about how we’ve been in California for close to two months now. It still feels like we just got here – I am definitely still unpacking. Oops? 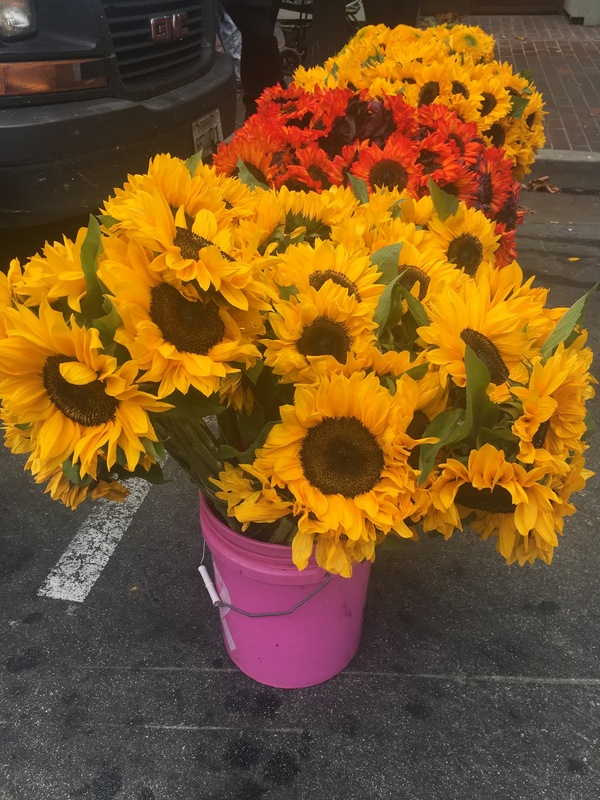 I am a big fan of farmer’s markets – in Connecticut, they were decidedly not year-round thanks to the lovely season we know as “winter.” This market is half-farmer’s market, half-other types of vendors. We can buy vegetables…and shawarma…and flowers…and art…and just about anything you can think of. Plus, when you finish your shopping, there’s tons of restaurants and bars along Alvarado Street to quench your thirst and satisfy your hunger. The produce here is all top-notch and the prices are unbeatable. We got a fantastic lamb “beefstick” along with our vegetables the first time we went, and all of the assorted snacks we have purchased from the food truck vendors have been to die for (seriously…I could eat shawarma for every meal). I. Love. Ice cream. I cannot turn down good ice cream. It is my weakness, my vice, and everything in between. Unfortunately, my mild lactose intolerance means that ice cream does not love me as much as I love ice cream. When we arrived in Monterey, some friends introduced us to Revival, describing it as “kind of quirky.” Quirky it may be – but it’s all made in-house using locally-sourced, in-season ingredients. Plus, the first time we went they had a dairy free ice cream flavor!!!! (Chocolate praline, I believe, but don’t quote me). And it was delicious!!!!! I am not gluten-free, but one of my best friends is, so she almost immediately received a “I FOUND AN ICE CREAM PLACE WITH DAIRY AND GLUTEN FREE ITEMS” because that is something worth celebrating! Like I said, I love ice cream, so I often choose to suffer through the pain for the bliss of ice cream. 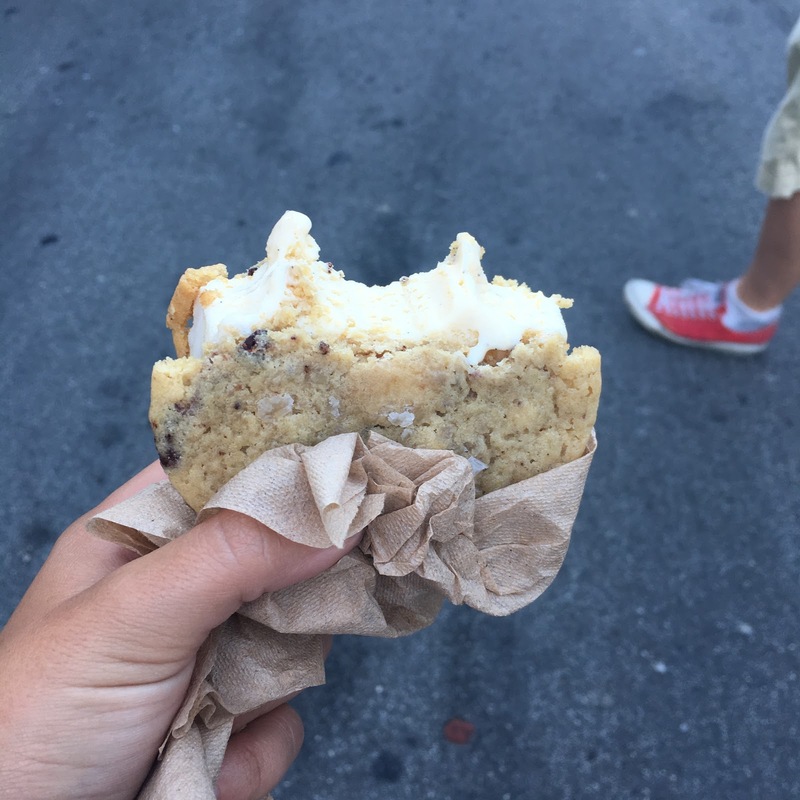 Pictured above is their sea salt chocolate chip cookiewich. Amazing. Apparently I have yet to photograph anything at Fieldwork! My bad! The Monterey outpost of Fieldwork Brewing Company, a brewery based out of Berkeley, is a nice outdoor space constructed out of a few shipping containers and a fence. It definitely takes “beer garden” to heart – the small fence and the gate are the only things separating it from the sidewalk. They have blankets and heaters surrounding the tables, along with two fire pits in the center of the seating area. It is a bring-your-own-food establishment – but it’s located next to a Peet’s Coffee as well as a Chipotle, and all the restaurants of Alvarado St. are just a short walk away. They have some pretty standard beers, all of which that I’ve had the opportunity to try are delicious (I thoroughly enjoy their Overripe! Northeast IPA) as well as some eclectic ones – the Petit Verdot Grand Gose is a complex, refreshing, and surprisingly drinkable beer. If you’re from Syracuse or an Empire Brewery fan, it reminds me a lot of their Deep Purple. Plus…Fieldwork is dog friendly! Anywhere I can both drink a beer and pet some dogs is a good place in my book. We have also had some chances to go and take some local adventures – keep your eyes out for a blog post about our Dali museum afternoon and a whale watch! Posted on October 11, 2017 January 14, 2018 by DaniPosted in localTagged beer, brewery, california, food, ice cream, market, monterey, tips.